Mr Mark Branson shared insights from his illustrious career and current senior position in the world of financial regulation to Lancaster students on Friday Week Four. 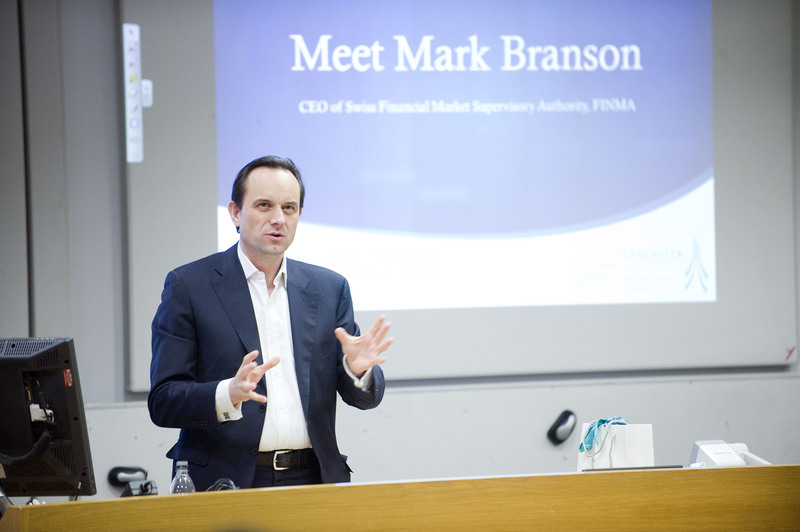 Branson is a LUMS graduate, who, after a career in finance spanning more than 20 years, is currently the CEO of the Swiss Financial Market Supervisory Authority (FINMA). The event, organized by the LUIFS society, had a substantial turnout, as the lecture theatre hosting the event was completely full. The importance of the event was highlighted through introductions by the Head of the Accounting and Finance Professor Steven Young, LUIFS founder, Daniel Schaaf, and LUIFS President, Paolo Bollag, who all lauded the efforts made by the university to host this event and thanked Mr. Branson for coming to Lancaster. Mr. Branson began by talking about his education, stressing on how he was driven to study Operational Research at Lancaster as he found it more practical compared to the education he received as an undergraduate at Cambridge, noting that the way LUMS combined quantitative methods with business problems is “just a relevant today as it ever was”. Since then, the university has changed a great deal and he commented that “this university has been thriving over the years”, since he graduated and began his career in consulting. He then went on to describe his work experience. Branson’s first encounter with banking and finance came when he spent the summer before university in a local branch of a retail bank. His career was defined by the decision in 1993 to work in the finance sector for UBS, which he felt provided more “dynamic” opportunities. While at UBS he worked primarily in investment banking and risk assessment, and on top of that he had the chance to work in London and Japan before settling in Zurich. Branson’s career has included a time as CEO of UBS Securities Japan Ltd, where was responsible for “investment banking, securities activities, asset management and wealth management in Japan”. Following the 2008 Recession, he decided to work in public sector, and accepted a position with FINMA, firstly as a Head of Banks in 2010. Following this, Branson accepted the position of Deputy CEO in 2013 before being appointed on his current role. Branson shared his views on building a successful and rewarding career with the attendees. “For me, what was important wasn’t ‘who is the employer?’ It was ‘what is the job and what is the opportunity?’” Branson told the audience that finance isn’t for everyone, and neither is management. Though if management is what you aspire towards, broad experience is essential: “if you’re interested in responsibility, management and progression in your career….don’t go too narrow….don’t put yourself in a box”. Finally, do what motivates you. This is “what everybody says, but not what everybody does”, but chasing a career which sounds prestigious at dinners will not necessarily lead you to the most fulfilling career. As for career planning, he warned you should not to expect anyone to plan their career for you, because financial institutions and employers “are not there to take responsibility for how your career develops, and nor should they be”. Also, don’t over plan, because, frankly “people who plan their careers years in advance are a little bit scary”. He also suggested that instead of planning for your career intricately, years in advance, you should be ambitious, but make sure you’re able to recognise new opportunities. A question many readers will have undoubtedly encountered in interviews is ‘where do you see yourself in five years?’ Branson says that when he asks this question, he is not asking for the details – marriage, children, or a goal salary – but “to see how you articulate the uncertainty of the future”. He then spoke about how the financial world stands today, and described how financial engineering models have long been criticised for their lack of clear-sightedness and excessive complexities. Branson was frank about the problems the issue is facing, noting how “the financial industry, in particular banking and trading, has a massive problem with its culture”, which has driven trust in the industry to an “all time low”. Though, he ended his point on a more positive note, expressing his hope that “we can go in the direction of a more responsible culture”. A Q&A session ensued for the following half an hour where Mr. Branson voiced his opinion on issues regarding market regulation, the role of lawyers in finance and crypto currencies, as well as responding to how he was not afraid to move from UBS to FINMA for less money, as he felt the importance of responsibilities and new experiences over the size of his salary. At last, thanks to the Investment and Finance Society, the Accounting and Finance Department and the LUMS Careers, Alumni & Employer Relations team for coordinating this event for Lancaster students.